Being new to jdorama, first noted him in Jigoku no Sata mo Yame Shidai (Monster-in-law), where he spoke perfect English! Stellar, heart wrenching and breakthrough performance in Ame to Yume no atoni, but rating was not very high - poor midnight slot telecast in Japan? Should have landed with more lead roles after this.... In Konshu Tsume ga uwako shimasu (My wife is having an affair this weekend), livened up an interesting character despite being supporting cast. Is this the case of the wine getting better with age, like Abe Hiroshi? Now trying to get Chiipu Rabu, one of his earliest work where I read his performance was great as well. If you are reading this, Sawamura-san, Bravo! he was ok.1st saw him in shomuni2.to me,he was handsome,err...may be due to his dimples!!! 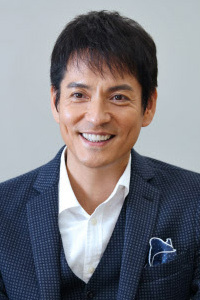 !but he's already old,but nevertheless,he looked kakkoii in gokusen and shomuni. He's such a good actor! One of the better one's out there. All the parts he plays are unique and interesting. I've only seen him acting in Shotgun Marriage...and he sure got my attention! He has a certain charm about him that I really like.